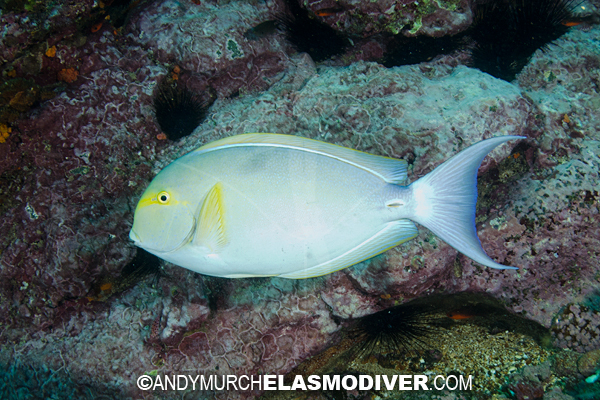 This extension of Elasmodiver contains a list of links to fish pictures taken by marine life photographer Andy Murch. For further information on image licensing, please e-mail Elasmodiver quoting the image names and numbers that you are interested in, the intended usage, and the size of the print run if applicable. Please scroll down below this thumbnail gallery, if you would like to search the fish pictures alphabetically by common names and scientific names. If you cannot find what you are looking for please contact Elasmodiver as we may have the image archived. All of the fish pictures on Elasmodiver are internationally protected by copyright law. There is a fee associated with any usage regardless of the nature of the project. ANGUILLIFORME PICTURES - IMAGES OF MORAYS, SNAKE EELS, GARDEN EELS, RIBBON EELS, CONGER EELS, SNIPE EELS, ETC. BERYCIFORME PICTURES - IMAGES OF SQUIRRELFISHES, SOLDIERFISHES, FLASHLIGHT AND LANTERNFISHES, FANGTOOTHS, SPINYFINS, ROUGHIES, REDFISHES, ETC. GASTEROSTEIFORME PICTURES - IMAGES OF STICKLEBACKS, SNIPE EELS, TUBESNOUTS & PARADOX FISH. Pacific Highhat - Pareques sp. Many more fish pictures will soon be loaded onto this list. Please bookmark this page and return frequently.